I had to attach the motor mount for my Wasp engine (thread in aircraft forum) with 0-80 cap head machine screws. In the position they were in, the open end wrench set I have would be a pain- the screw is surrounded by a lot of junk. A socket would be ideal. But I didn't have a set of sockets that small. I remembered I had once made a socket wrench from aluminum tubing one time, so I tried it again. Looked like a 1/8 inch aluminum tube would just not quite fit over the head- just right. I had a lot of K&S tubing on the bench, so I tried it. I took a block of MDF, and drilled a 1/16 hole in it, deeper than the length of the screw, and inserted the screw so the head was supported by the MDF. I placed a 3" length of the tubing over the head (carefully) and gave it a few taps with my modeling hammer. It swaged the end of the tube down over the head snuggly. In fact, the screw came up out of the hole when I lifted the tube. But the screw was easily removed and it looked like a nice socket wrench. 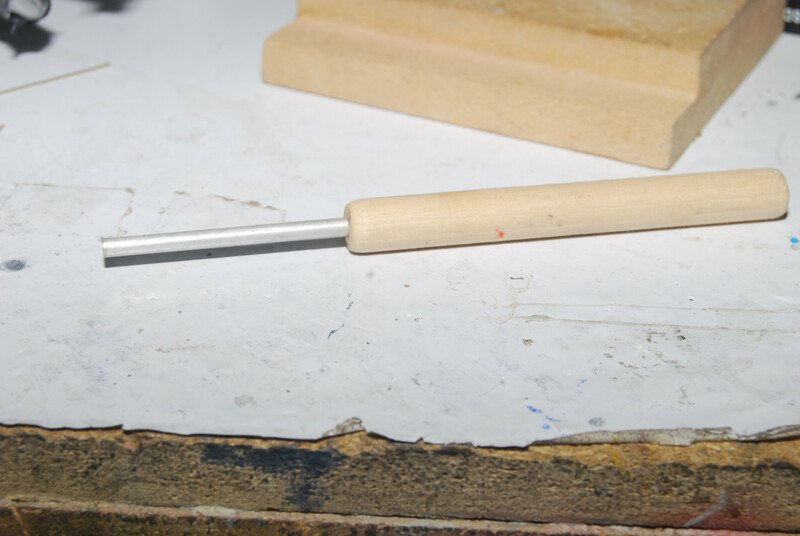 To make it a bit easier to handle, I cut a length of 1/2 inch dowel, drilled a 1/8 inch hole in one end, and rounded the edges of the dowel a bit for comfort when using it. Put drop of CA on the end of the tube and stuck it into the dowel. I drill out the holes in the manifold where the mount gos with a drill appropriate for tapping for the 80 screw. Now, I didn't bother to tap the holes in the engine where the mounting screws go. I figured a #80 screw like that would self-tap easily into the hole- it did. Drove the screws with no problem. They were brass- dropped them into brass blackening solution before using them. By coincidence, got a new Micro Mark catalog today, and found a set of four sockets for small screws- 20 bucks for the set. I figured I saved almost five bucks, considering the value of a three inch length of K & S tubing. Anthropologists think that a good measure of the advancement of a species is its ability to devise tools to achieve tasks. Are you implying Don is the most advanced ape here?